CC science labs are becoming more environmentally friendly thanks to the work of several faculty members and the launch of the Green Labs project. Over the past year, Barbara Whitten, professor of physics, and Emilie Gray, assistant professor of organismal biology and ecology, have led an effort to change CC science departments’ use of materials and equipment to encourage efficiencies in energy and resource use. Improvements in battery and paper recycling, as well as reducing energy used by refrigerators and ventilation equipment, are also part of the CC Green Labs project. Green Labs is also an active movement at colleges and universities across the country. Whitten first brought up the concept during a brainstorming session at the end of the 2013-14 school year, and later presented the idea at a Sustainability Council meeting where Gray and several other faculty expressed interest in the project. “I got interested in this project because if you look at energy density, or energy per square foot, all of the science buildings are at the very top of the list,” said Whitten. She was particularly curious about why Tutt Science Center, a building constructed to be Leadership in Energy and Environmental Design (LEED) certified, was also using large amounts of energy. After some research, she found that science buildings are universally energy inefficient. She discovered the national Green Labs movement, working to make science labs more efficient. Much of the energy use in science labs comes from equipment like the ultralow freezers and ventilation hoods. Kathy Ramirez, Green Labs manager at CU, has since visited CC and given her input on how to improve the school’s labs. Whitten says she hopes the Green Labs initiative will reach beyond energy conservation. Whitten and Gray have collaborated with Ian Johnson, CC’s sustainability manager, and together they have set up a fund to assist in purchasing sustainable equipment. This fund has already been used to buy a high-efficiency freezer. Whitten, Gray, and other members of the Green Labs project will continue to make changes to the labs that will reduce energy and resource use. They also aim to be involved in plans for constructing new science buildings on campus in the future. 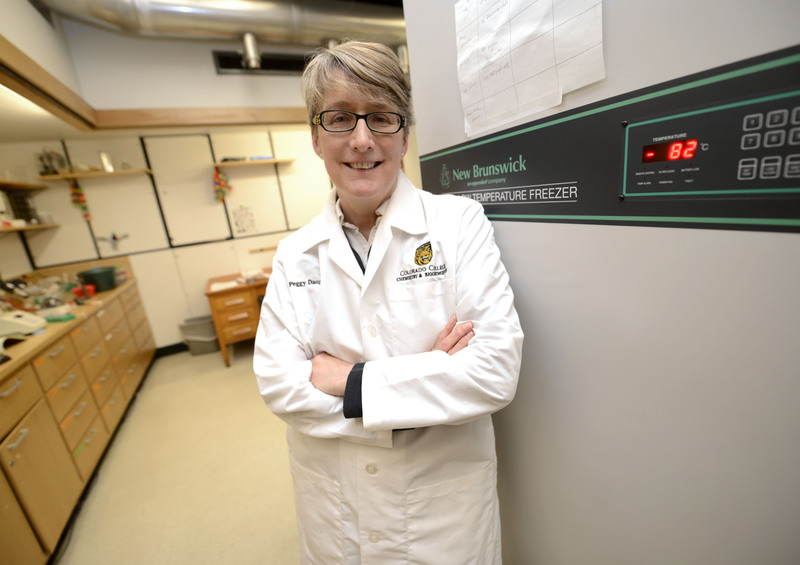 Peggy Daugherty, associate professor of chemistry, with a new high-efficiency freezer.